Egg cups are super easy to make and you can customize them by adding your favorite omelet style fillings. 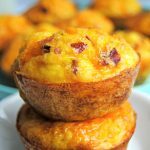 The addition of a tater tot crust packs a big breakfast taste into a muffin sized cup. Place tater tots on a dish and microwave for 1-2 minutes to defrost and soften. Spray regular size muffin pan with cooking spray. Place 3 tater tots in each muffin tin. Press down and smash the tater tots to make a crust and salt. In a large measuring cup or small bowl whisk eggs. Add milk to the eggs and salt to your liking. Once the tater tots are done, remove them from the oven and sprinkle your fillings on top of the tater tots. Pour egg mixture on top of the fillings. Can be made up ahead of time and kept in the fridge or freezer. Reheat in the microwave.